Using the latest Hyperledger Fabric technology, providing seamless integration and connectivity among networks, businesses and people. TraXion is a new ICO and it’s main focus is to build a secure infrastructure for the everyday users. With the use of blockchain, it aims to chainge how people do business by using data integrity, accountability, transparency, and trust. Their solution is to use a platform on the blockchain ready for business use. This means it’s highly scalable, unchangeable, permissioned, and has all the infastructure to create smart contracts, business provenance and data visibility. In conjunction with IBM, TraXion will be using their Hyperledger Fabric technology. So, why should one use TaXion? The team at TraXion have a huge amount of experience combining 20+ years in different industries from blockchain technology, cyber security, finance, and business development.They have current working contracts and partners which will be one of the first platforms to use the IBM Hyperledger. We like this as IBM has kudos and is a household name. They wouldn’t risk their name and reputation if they didn’t believe in this technology. TraXion also has connections with several financial technology services (GlobalLinker & Unionbank) creating a 360 finacial solution/service for them.TraXion has it’s own eccosystem, which is a network of users made up of Individuals, conglomerates, merchants, and non-profit organizations. This infrastructure is embedded allowing a thriving crypto economy, free of the usual centralised flaws such as fraud & bureaucracy. These variables can be summed up into three groups: 1st — Token economics & Product. 2nd — Team and Advisors. 3rd — Social media and general publicity. Firstly if you’ve seen their token structure on ICOBench or FoundICO, please ignore it as the hard cap is wrong. On these platforms it says their hard cap is a whopping $100 million, i contacted the team directly and they assured me that this was incorrect and it is in fact $60 million. Ann Cuisia TraXion’s CEO said; “There was a miscomputaion on the initial amount. We originally pegged it to ETH and during the time of writeup, the $ conversion amounts to $100M which shouldn’t be the case.” So, always do your own research and never rely on 3rd party platforms to give you correct information, always go to the main source either the website or telegram page. 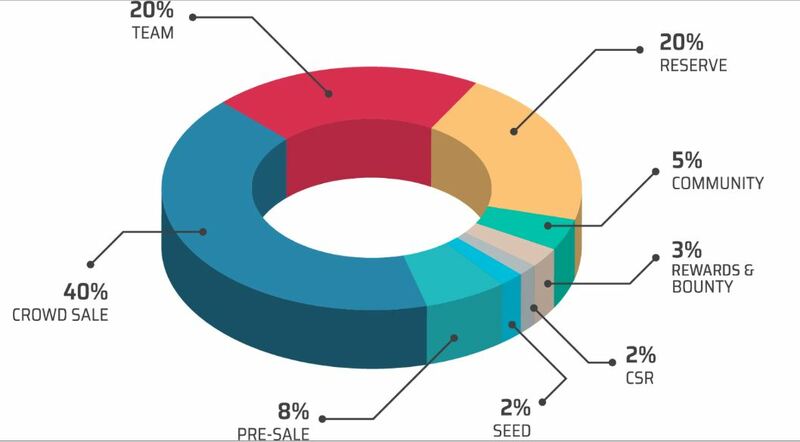 As you can see from the above chart, 40% is allocated for Crowd Sale, 8% for Pre-sale & 2% Seed, making up the 50% of total cap for ICO. Seed funding is a form of securities offering in which a person invests capital in exchange for an equity stake in the company. These will typically be accredited investors willing to put large amound of capital to receive shares in the company as well as tokens. We noted that 20% of the tokens are reserved for the team. Although I believe people should be rewarded for their hard work, i do feel this is slightly on the high side. The value per token is fairly low & pegged to ETH, but as we move out of a bearish market the token’s (i believe) will be worth a lot more in the coming weeks and months. Ann Cuisia is CEO of TraXion, she has 20+ years of experience in IT. She has a BS in Mathematics/Computer Science from the University of Santo Tomas based in Manila. She has been a pioneer in the Philippines for helping non-profit organizations achieve its digital transformation and online giving facilities. This is perfect, as we need good knowlege of this market for the fundraising platfom side of TraXion. Tamer Maher the COO use to be Project Management & Business Consultant for ScrumAndLean for 7 years. Prior to that he’s had a few short term contracts with Fonteyne The Kitchen (Management Consultant), CopernicusMD (Technology Officer), BRISK Business Inc. (Senior Consultant). Tamer has clearly had experience managing operations and consulting for different clients which is a plus. Anand Vemula is the CTO and is a self proclaimed Blockchain, Digital & Cyber Security Transformation Evangelist. He has over 18 years experience in IT, several blockchain POC projects and payment gateway integrations using Hyperledger. (This is KEY!) He has experience in AML, KYC integration and cross-border payments. He is well versed in Ethereum Solidity, Token Sale, Cryptocurrency, Microsoft Blockchain As a Service, IBM Blockchain on Bluemix, and Hyperledger. Anand is a big asset to the team as he is hugely experienced in using the Hyperledger, TraXion’s MVP. Nathan Christian is well versed in ICO’s and tech start-ups. He is advisor in other ICO’s including, FriendZ & Omnitude and is also ICO Campaign Manager for TravDove Inc. which reached it’s hardcap of $52 million. Take a look at this clip of Yobie Benjamin breaking down the importance of what TraXion is trying to achieve. As you can see the numbers are fairly low, but as it’s still early days i won’t mark them down on this just yet. We are still over a month away from ICO Pre-sale and once the word get’s around and people start looking into the next big ICO i’m sure TraXion will come into the limelight. They are active on Twitter and Telegram so it’s only a matter of time until the hype & proof of product carries them to the moon! Although the team haven’t help jobs in huge bluechip companies (which is what i look for in a team) I do believe they have the right experience. This and the fact that they have an amazing board of advisors, TraXion could go very far if they can achieve and stick to their roadmap. They already have a working model & partnerships in place. They’ve launched their payment platform TraXionPay.com which supports payment integrations for merchants’ use with various payment gateways. They have also launched thier funraising platform Gavagives.com which is an end-to-end fundraising platform helping to empower non profit organization, including optimising/improving and managing their donors and donations. This is far more than most ICO’s have out there that’s for sure! The main thing I like is the use of the IBM Hyperledger too. IBM has huge kudos and is a household name, they wouldn’t risk their name and reputation if they didn’t believe in this technology, this holds huge value for an ICO in my opinion. I for one will be keeping a keen eye on their progress in the coming weeks as they lead up to their token sale.